These perfectly shaped petit cabbages are irresistible when pan-roasted. Sweet, nutty and slightly crunchy, they’re intensely flavorful tiny packages. But when you add a drop of maple syrup to the pan, their sweetness gets intensified, making them even more delectable. 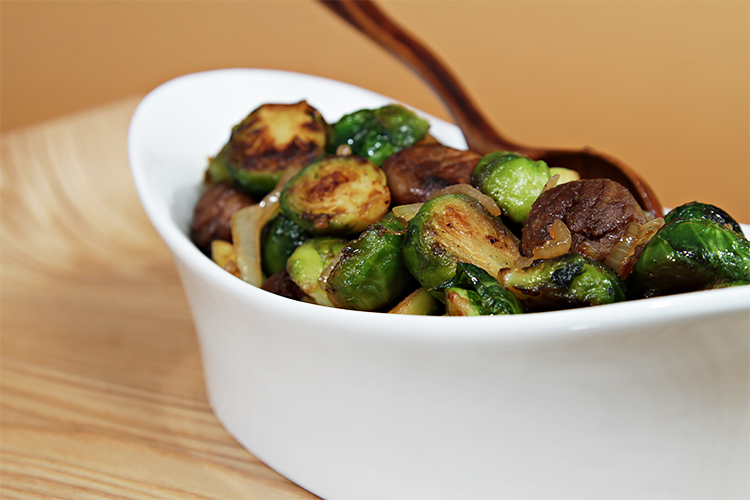 Roasted with whole chestnuts, the Brussels sprouts acquire an earthy flavor that adds another dimension to the dish – and makes for a superb and versatile side dish that, come fall, almost always ends up on the menu. Heat a large heavy-bottomed skillet over high heat. Add the butter, olive oil and maple syrup, stir well. As soon as the butter is melted, add the Brussels sprouts and chestnuts and toss carefully with two wooden spoons (so as not to break the chestnuts) until the ingredients are well coated with the oil. Sauté for 7 to 8 minutes until golden-brown, tossing only occasionally. Reduce heat to medium-high, add the shallots, salt and pepper and sauté for 1 to 2 minutes until shallots have softened. Transfer to a serving platter and serve immediately. 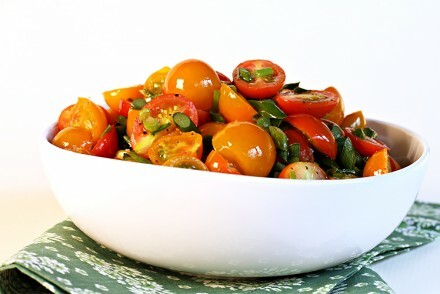 Flash-sautéed cherry tomatoes with garlic scapes A super-flavorful veggie side dish recipe. Celebrate scape season! 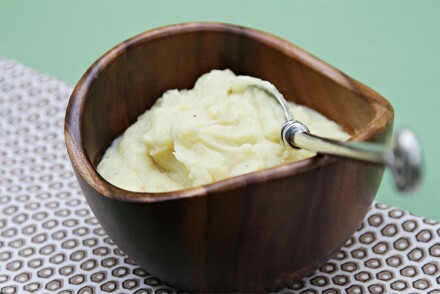 Mashed potatoes with garlic confit How to make the perfect garlic mashed potatoes? Use poached garlic! Since I have a nut allergy, what would you suggest in replacement for the chestnuts? Or is it best as is minus the nuts? Hi Fran, I would suggest omitting the chestnuts altogether and putting a few more Brussels sprouts. Enjoy! I make this dish with brown sugar blend . Being diabetic,watching my sugar intake is essential for my health.I love this veg.and can enjoy it without any guilt. Honestly I have never tried brussel sprouts these look gorgeous enough to try. You have combined them with chest nuts that makes it a complete new dish. This looks so great! Love your simple, and stylish presentation. Viviane, This recipe looks delicious and I can’t wait to cook it. Thanks for the recipe I’m going shopping tomorrow. These are perfect. I love the combination of chestnuts and brussels and this is perfectly cooked. I can’t wait to share this with my dad so we can make it during our thanksgiving feast. I just love this recipe. I am sure the maple really warms up the flavor. I really want to introduce this amazing vegetable to my husband….this may be the route. I never would have thought to put these together! A huge thank you to all of you for your wonderful comments and words! You’ve totally made my day…. And I am so pleased that Brussels sprouts are getting a little well deserved attention. Brussels sprouts are popping up everywhere these days and I have to say, I LOVE it. These look amazing, I love them with a touch of maple! Congratulations on not making Brussel Sprouts not only look edible, but good! I haven’t had them since I was a kid and I recall them being especially yucky. But I might have to give them a second chance. There will definitely be another table in the land that will be serving these at Thanksgiving. What a lovely recipe. The photos are beautiful too…the very reason I clicked over from FoodBuzz! 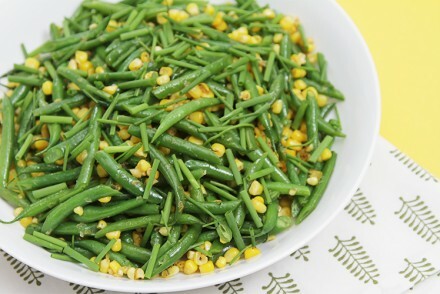 This is the perfect side dish for the holidays! And I agree with Liz, I would love this dish all to myself! Congrats on the Top 9! These look awesome! Truly stunning photos!! I’m adding Brussels sprouts to our Thanksgiving table…and I won’t be disappointed if nobody else will eat them as it means more for me 🙂 Have a lovely weekend! What a beautiful looking dish with brussels sprouts! I love that you added chestnuts. Yum! I like Brussels sprouts but rarely make them. I need to give this recipe a try! And I love the adding maple syrup to just about anything! Gorgeous dish! It’s perfect for the holidays! 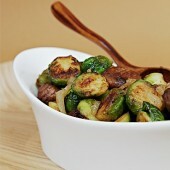 Viviane, I absolutely LOVE brussel sprouts and make them for myself often. These look so delicious. I love the idea of the maple with these! Now to try to find chestnuts somewhere near me. 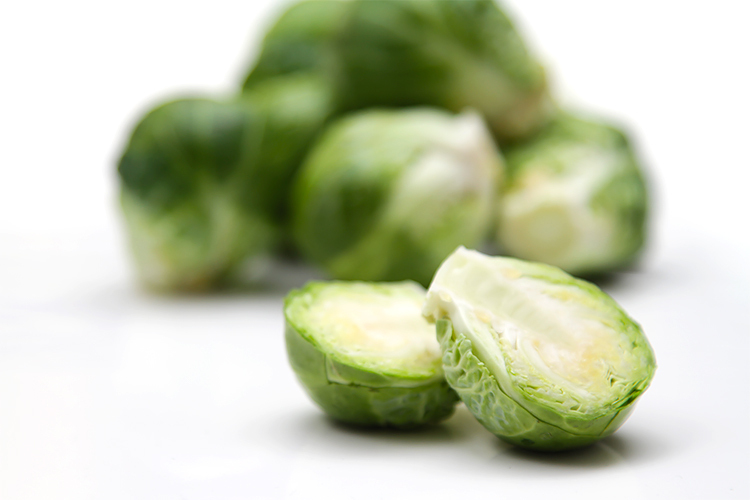 Brussel sprouts are one of my favorites…and I have great maple syrup from my in-laws, so I will try this! Steph, RavieNomNoms, Cucina49… Thank you so much for your comments! Maple syrup is an amazing ingredient, isn’t it? This is SO amazing! I have to try this. I love brussel sprouts!! I have to remember to add maple to mine next time!! YUM!